I live in the mid-Atlantic region of the United States, where our winters are cold, dull and gray, and our springs are nothing short of spectacular. Each year, for as long as I’ve lived here, I’ve looked forward to spring cleaning – that act of clearing out the winter cobwebs, opening the windows, and clearing the clutter that’s accumulated over the long months of being cooped up inside. According to Wikipedia, the notion of spring cleaning dates back to the Iranian Nourouz, or Persian New Year, which falls on the first day of spring. Iranians practice “khooneh tekouni”, which means, literally, “shaking the house”. 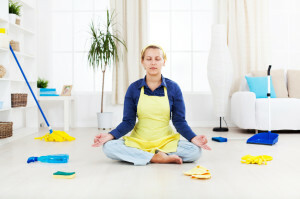 It’s also thought to have a connection to the Jewish practice of cleaning thoroughly in anticipation of Passover. It makes sense, doesn’t it, that spring is associated with cleaning, since it’s also associated with renewal and refreshing? This year, I’ve found myself, more and more, practicing spring cleaning on my own mind. As I learn more about how my brain works, I’ve realized how many cobwebs are up there, getting in the way of my creativity, limiting my abilities, trapping me in old habits. Scripts that play in my head continually remind me of past failures, visual memories of things that didn’t go just like I planned, or hoped. But it’s amazing how, with a little effort, we can clear our minds of all that “stuff” and create new, healthier, happier habits of thinking. One of our challenges with changing our behavior is that it requires us to literally think differently. And we believe, based on the limited knowledge of the past that we need to think about what we want to change, and then reinforce the change with new thinking. But it turns out that’s only partly accurate. The latest neuroscience studies demonstrate that we can’t just change our thinking. We have to change it in the right direction. If you know me, you’ve heard me cite this statistic, because I find it fascinating, and whatever I find fascinating, I tend to repeat. Five times per second, our brains are analyzing the environment to determine what we should go toward (reward) and what we should retreat from (threat). Five times per second. Add to that the fact that the brain hardwires everything it can, even the negative. Here’s what that means to you and me as we attempt to correct bad habits. If I want to stop a bad habit, even if it’s just a thought habit, I can’t change it by thinking about the habit itself, because my brain will hardwire for the habit as well as for the change I want to make. That creates an endless loop of reinforcing what I’m trying to undo. Let’s say, for example, that I want to stop eating so much sugar. When I say that to myself, I have reinforced the neural wiring for eating sugar! The brain can only picture me eating sugar, and then stopping. It can’t visualize the absence of eating sugar. By thinking the words “eat sugar” I may be inadvertently creating a toward (reward) response for sugar, which may lead me to eat more it, rather than less. So, if I really want to stop eating sugar, I need to tell myself that I want to eat more salads, more veggies, more fruits, more popcorn. Whatever it is that I want to do instead, rather than what I want to stop doing. That gives my brain something to go toward, and it creates new neural pathways toward healthier eating habits. We know now that it’s nearly impossible to deconstruct our wiring, but it’s pretty easy to create new wiring. And that is what is helpful when we’re trying to clean out the bad habits of thought. With enough attention, new neural maps become hardwiring. I’m so disorganized becomes I’m getting more organized. I’m not a very good swimmer becomes I’m getting better at swimming, with practice. I can’t speak a second language becomes I’ve not yet mastered a second language. The differences may seem subtle, but to our brains, they are huge. The new wiring creates opportunities, and more positive feelings. Negative self talk doesn’t help us change; it only makes us feel bad while it’s not working. We all have habits of thought that limit us. We constantly compare ourselves to others, we continually think about what might have been, if only. We worry about our vulnerabilities, our weaknesses, until they become larger than they really are. We all have some part of ourselves that we’d like to change. Some are changeable, some are not, but our own thoughts are perpetually changeable, fluid, and flexible. And we can use that flexibility to our advantage. Spring is a great time to start thinking about how truly awesome we each are, to focus our thinking on all that’s right about us over what’s wrong with us, to make a dedicated effort to improve our quality of life by improving the positive qualities of our thinking.